At long distances FSO transmissions are susceptible to atmospheric-induced attenuation. System designers have tried to overcome this problem in a variety of ways-with only limited success. Adaptive Optics (AO), can restore lightwaves deformed by the atmosphere to near-original condition, tackling the root-causes of scintillation, wander, and beam spreading. Adaptive optics promises to revolutionize FSO communications by meeting new carrier requirements: true speed- and protocol-independent links that operate over longer distances, at higher bandwidths, through any office window, and with greater reliability-in all weather conditions. Small, random phase changes cause constructive and destructive interference, resulting in a “speckle” pattern of variable light intensity across the receiver aperture called scintillation. Pockets of air with varying densities exist in a range of sizes-from a few millimeters to meters in scale-and they constantly grow, shrink, and move around at rates up to 100 Hz. Because the speed of light through air depends on the index of refraction, these ever-changing pockets of air act as a collection of changing lenses that cause the beam to wander at the receiver. Sources of heat that contribute to wander are common in urban and suburban areas and include streets, parking lots, rooftops, and building exhaust vents. Also the constantly changing index of refraction causes some parts of the beam to slow more than others, distorting uniform wavefronts that exited the transmitter. These small, random phase changes cause constructive and destructive interference (see Figure 2). Also again, changes in index of refraction cause beams to spread out in transit, reducing the energy on the central axis. Finally, beams wander because of the relative motion or sway of buildings and towers exposed to wind loads and non-uniform thermal expansion from solar heating. Why use Adaptive Optics in FSO? Without adaptive optics, scintillation causes fast and deep (~40-dB) signal fades that make it impossible to receive the signal. With adaptive optics, the average scintillation loss and standard deviation of loss are greatly reduced and within the tolerance of the receiver. Previous military and astronomical AO systems have been unidirectional, either correcting deformed light from stars and galaxies through telescopes or pre-deforming outgoing light in the case of laser weapons. FSO systems are now available for the first time that point two AO units at each other in a bidirectional communications system. The deformable mirror therefore not only corrects the incoming-light wavefront, but also simultaneously pre-deforms the outgoing-light wavefront to pre-correct for known aberrations in the light path between the two units. Pre-shaping the beam from the transmitter to correct for known atmospheric conditions eliminates wander and scintillation so that the beam can be locked onto its target. 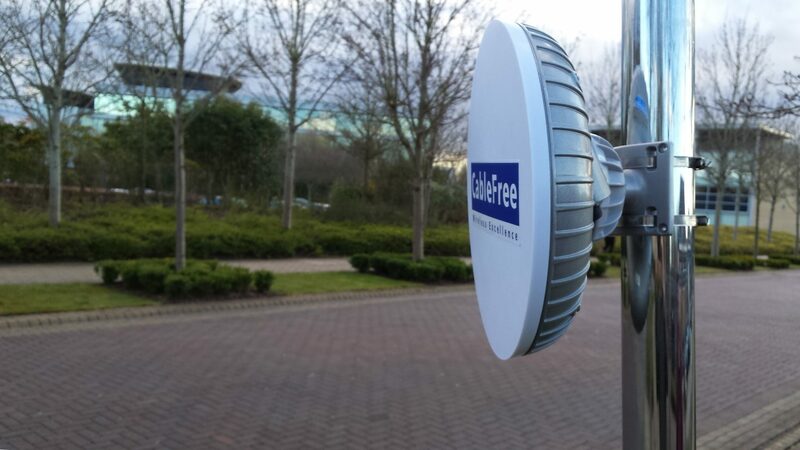 The CableFree team have invested several collaborative efforts in researching Adaptive Optics with FSO including two published papers with collaborative partners.